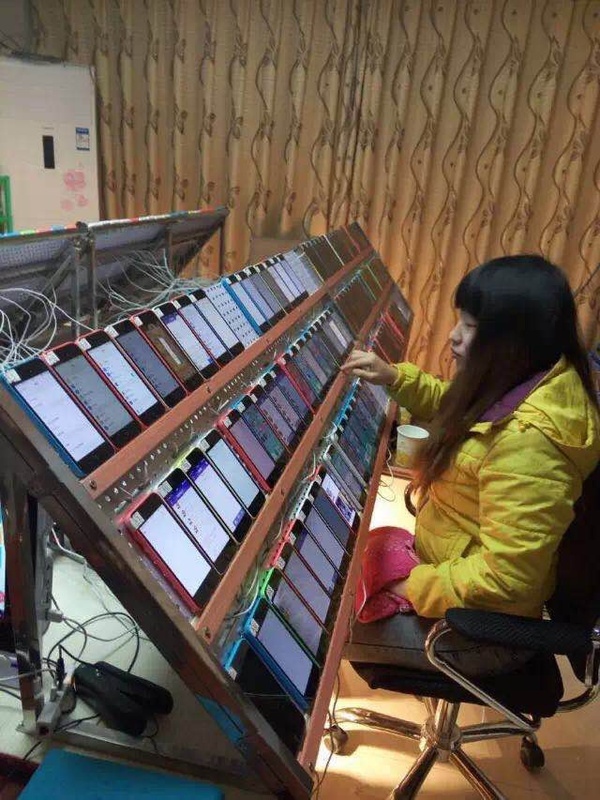 This year-old photo of a woman seated at a wall of Iphones went viral on Chinese social media, where it was identified as a clickfarmer whose job is to repeatedly install apps on multiple phones in order to inflate their App Store ranks. The service -- which puts your app into the top 10 free apps -- reportedly costs about $11,000 in upfront costs, and $65,000/week for maintenance. Dozens of vendors advertise comparably priced services on China's Taobao marketplace. For many years, friends who work in app development have muttered darkly about the manipulation of Apple and Google's stores, saying that the largest companies have sewn up the top ten rankings by paying for huge stables of clickfarmers -- and indeed, the same handful of firms have dominated those top ten boards almost since their inception.